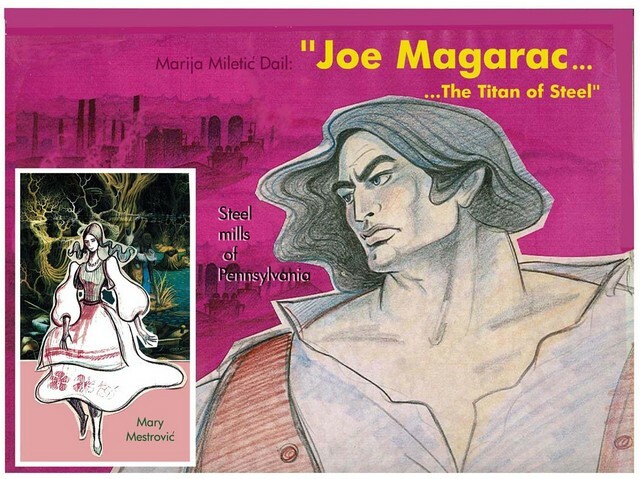 Joe Magarac was an imaginary folk hero, like Paul Bunyan, whose story came from eastern European immigrants working in Pittsburgh area steel mills. His physical power and his brave, generous, and hard-working character made Joe Magarac (whose name "Magarac" means "donkey" in Croatian) the greatest steelworker who ever lived. 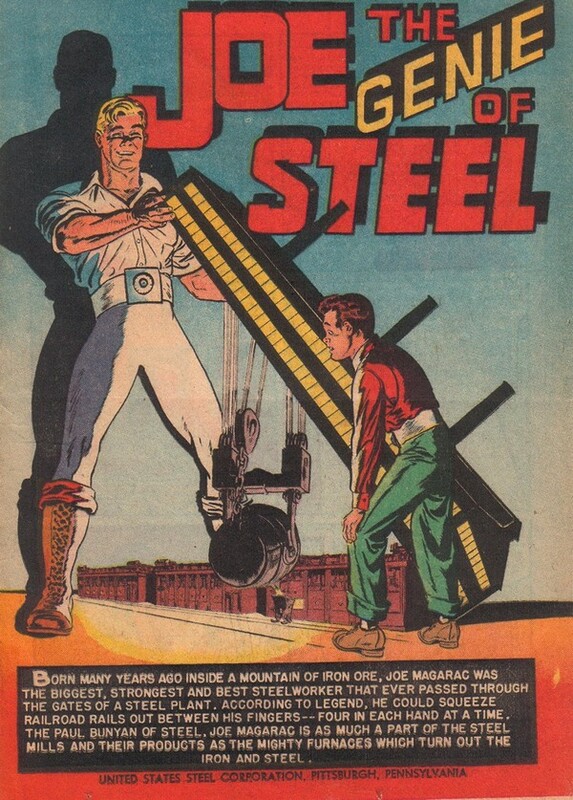 Joe Magarac, the story goes, was a man made of steel. He was born in an iron ore mine and raised in a furnace. Some versions of the story said Magarac was seven feet tall. Others claimed he was as tall as a smokestack! His shoulders were as big as the steel-mill door and his hands like the huge buckets (ladles) used to pour molten steel. He ate that hot steel like soup and cold steel ingots like meat. He could drink a gallon of liquid in one swallow. The mighty Magarac could do the work of 29 men, because he never slept, working 24 hours a day, 365 days a year. He stirred vats of hot steel with his bare hands and twisted horseshoes and pretzels out of iron ingots. He made railroad rails by squeezing molten steel between his fingers. As the steel cooled, he made it into cannon balls as easily as kids make snowballs. self-sacrificing, and brave. Once, for example, he won a weight-lifting contest and the prize was marrying the mill boss' daughter Mary. But Mary was in love with Pete Pussick. Instead of claiming his prize, Joe stepped aside so she could marry her true love (after all, if Joe had a wife, she would be very lonely while he worked 24 hours a day, seven days a week!). Joe could appear just about anywhere in the mill in seconds by walking from one hot furnace rim to another. He used this ability to appear out of nowhere to save steelworkers from danger. When a crane holding a ladle with 50 tons of molten steel broke right above his crew, he caught it with his bare hands. Not a drop of hot "soup" splashed on anybody. A whole train of loaded ingot-buggies broke loose and headed full steam downhill toward a group of employees. Just in the nick of time, Joe caught the last buggy and pulled the train back up hill, saving everyone! No one is sure what happened to Joe. 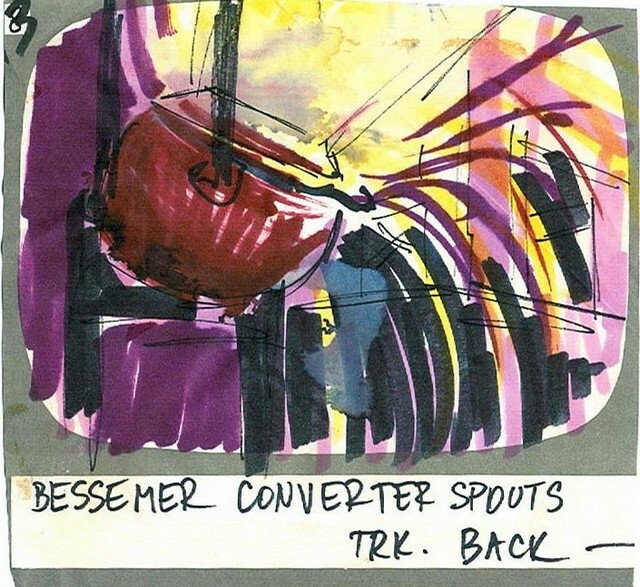 In one version of his story, he jumped into a Bessemer converter to save a load of steel and lives on in the girders of a new building or bridge. Another version claims that he is still alive, waiting in a abandoned mill for the day that the furnace burns again. 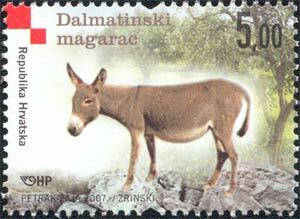 A very nice stamp issued by the Croatian Post in 2007, depicting Dalmatian donkey, ie Dalmatinski magarac. Dalmatia is a southern part of Croatia along the Adriatic sea. Some sources claim that the legend about Joe Magarac is of Hungarian origin. This is impossible, since "donkey" in Hungarian is "szamar", and "magarac" does not exist in Hungarian language. 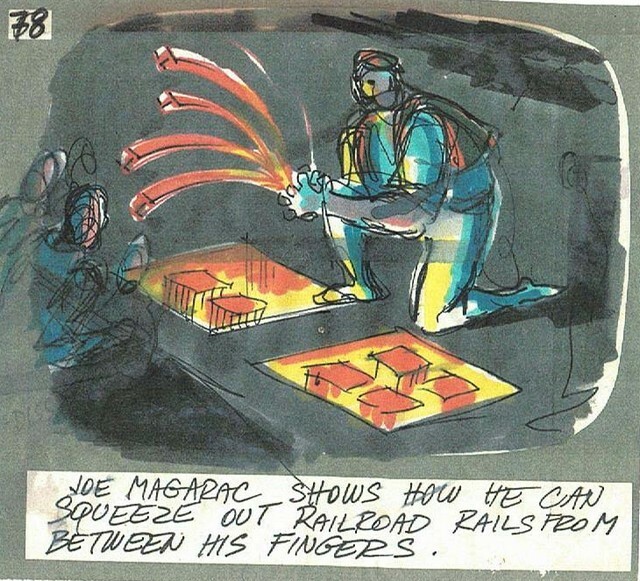 Joe Magarac - Born out of Braddock, Pennsylvania - Truth here is elusive, some beleive that there was actually a person by the name of Joe Magarac working at the Braddock steel works. He typicated the personality of a donkey, obstinate and very hard working. At the same time, the donkey was the beast of burden in the mountain regions of Croatia. The legend probably has merit. Altho the characterizations of this symbol varies slightly, it is easily recongnized as the symbol of steel and was to steel workers what Paul Bunyan was to woodsman. I have several childrens books featuring this character in the early 1900's. He does amazing feats and the stories impart hardwork and honesty as a lesson to small children. Part of him, legend....part of him, real. King of the ingots, Pride of the Mill. He fanned the white heat to an angry-red roar. And, taking a handful before it got cold. He squeezed through his fingers and watched it congeal. From taffy-like ribbons to railings of steel. And smiling, Joe Magarac melted away. Joe Magarac - Inherits the size! His strength can't be measured by muscles or height. His vision, his training. His tools are his might. He gathered together the ore of the past. He mixed in the "newest", the "finest", the "last". He adds education, the best he can get. And squeezes out ATOMS, and powers the Jet. With slide rules, computers and technical skill. There's steel in his courage and iron in his will. And Jon overheard them and went to their aid. By throwing himself into Science and Math. He burned with ambition and blazed out a path. JOE MAGARAC is Pittsburgh, today! The history of the mines, labor strikes in the steelmills by Croatians - Are you interested in bios of these people? They were treated about the same as the Chinese in early California days. 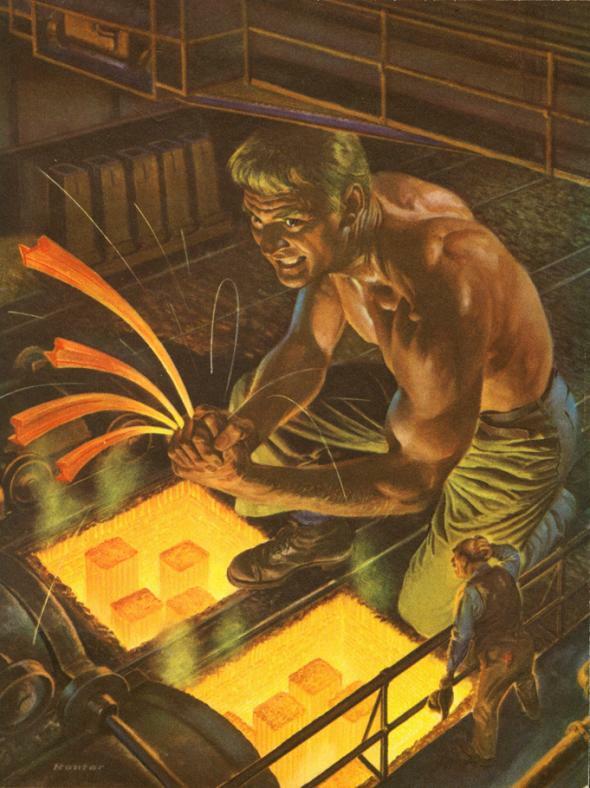 Joe Magarac, the legendary folk hero of the Pennsylvania steel industry, first appeared in print in a 1931 Scribner's Magazine article by Owen Francis. 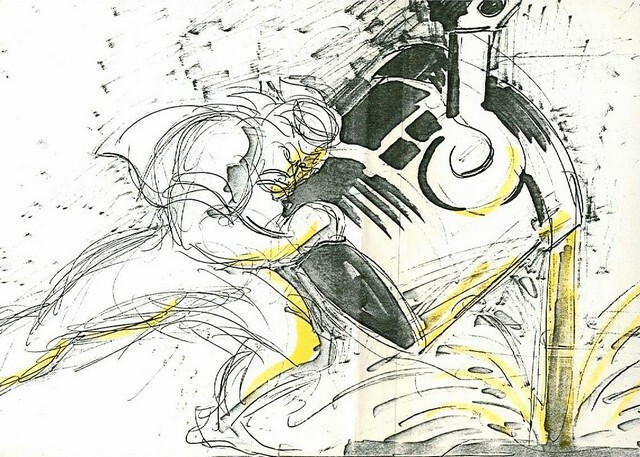 It is unclear whether his story was born in Pittsburgh area steel mills or local newspapers, but by the 1930s Joe Magarac was the folkloric hero of Pennsylvania steelworkers. Working 24 hours a day, 365 days a year, Magarac, which means "donkey" in Croatian, could squeeze out railroad rails from between his fingers and appear out of nowhere to protect steel workers from molten steel and other dangers. One tale says that Magarac, who was made of solid steel, melted himself in a Bessemer furnace for material to build a new mill. Another suggests that today he waits in an abandoned mill, waiting for the day when the furnaces burn again. I first ran across the Joe Magarac story and poem in an anthology of American folklore which included the famous logger Paul Bunyan and his blue ox Babe some thirty years ago. 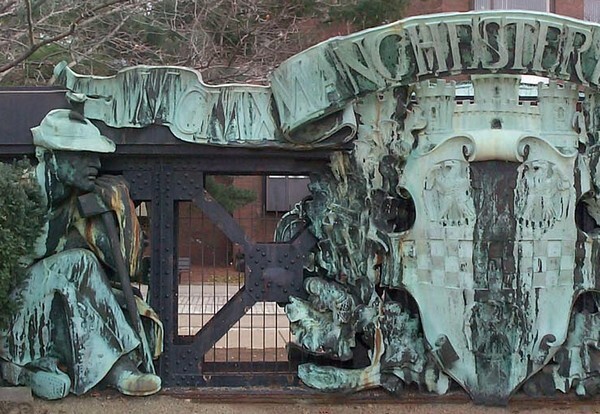 The tenacity of the Croatian steelworker was embodied in this mythical figure and represents the the hard work and sacrifice of Croatian-Americans to building this heavy industry. This industry employed thousands of Croatian emigrants from the turn of the 19th centry to post-WWII America. The record time for relining a blast furnace for reuse in a steel mill was held by a group of Croatian workers. Its great to see the the Joe Magarac story presented once again for people to become aquainted with. Wish I would have found this 10 years ago, before I retired.This would have made a great lunch room posting.